Fertilizers are used to add plant nutrients not adequately supplied by the soil. A soil test is used to determine the amount of nutrients in the soil. The soil test report will make recommendations for the amount and type of fertilizer and/or lime you need to add to the soil for optimum plant growth. 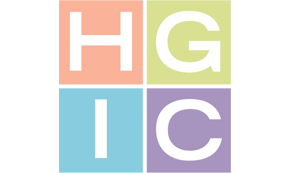 For information on soil testing refer to HGIC 1652, Soil Testing. There are 16 nutrient elements that are essential for the growth and reproduction of plants. Plants obtain the three most abundant nutrients – carbon, hydrogen and oxygen – from water and the air. The other 13 elements are divided into three categories: primary, secondary and micronutrients. Nitrogen (N), phosphorus (P) and potassium (K) are primary nutrients which are needed in fairly large quantities compared to the other nutrients. Calcium (Ca), magnesium (Mg) and sulfur (S) are secondary nutrients which are required by the plant in lesser quantities but are no less essential for good plant growth than the primary nutrients. Zinc (Zn), manganese (Mn), iron (Fe), boron (B), copper (Cu), molybdenum (Mo) and chlorine (Cl) are micro- nutrients which are required by plants in very small amounts. Fertilizers may be divided into two broad groups: organic and inorganic, or chemical. An organic fertilizer is derived from a living plant or animal source. Chemical fertilizers are usually manufactured and have the advantage of low cost. The commonly used synthetic fertilizers consist almost entirely of nitrogen, potassium and phosphorus in forms that are readily utilized by plants. In contrast, the organic fertilizers are more likely to have significant amounts of micronutrients, and the macronutrients are likely to be in forms that are not as readily absorbed. Nitrogen in an organic fertilizer is slow in becoming available for plant use because the organic nitrogen must be reduced by micro-organisms to ammonium (NH4) and nitrate (NO3). Thus, the inorganic fertilizers are “fast,” while the organic fertilizers tend to be more “time- release.” A potential drawback of organic fertilizers is that they may not release enough of their principal nutrient at a time to give the plant what it needs for best growth. Because organic fertilizers depend on soil organisms to break them down to release nutrients, most of them are effective only when soil is moist and the soil temperature is warm enough for the soil organisms to be active. Microbial activity is also influenced by soil pH and aeration. The use of organic fertilizers increases the soil’s organic matter content and improves the soil’s physical structure. Inorganic fertilizers can be one of the major sources of groundwater pollution. The nitrogen is in such a soluble form that it tends to leach from the point of application. Water-soluble chemical fertilizers will injure plants if not washed or brushed off the foliage. Slow-release fertilizers are less susceptible to leaching and are preferred on sandy soil types, which tend to leach. Inorganic Fertilizers: Various salts and minerals can serve as fertilizer materials. Examples are ammonium sulfate, potassium nitrate, super- phosphate, potassium chloride and potassium sulfate. Synthetic Organic Fertilizers: These are human-made organic materials used for fertilization. Examples are urea and ureaform. Cottonseed meal is a by-product of cotton manufacturing. Formulas vary slightly but generally contain 7% nitrogen, 3% phosphorus and 2% potash. Cottonseed meal is frequently used for fertilizing acid-loving plants, such as azaleas, camellias and rhododendrons. Blood meal is dried, powdered blood collected from cattle slaughterhouses. It is a rich source of nitrogen, and it supplies some of the essential micronutrients, including iron. Fish emulsion, a well-rounded fertilizer, is a partially decomposed blend of pulverized fish. The odor is intense but it dissipates within a day or two. Manure is a complete fertilizer, but low in the amounts of nutrients it can supply. Manures are best used as soil conditioners instead of nutrient suppliers. Sewage sludge is a recycled product of municipal sewage treatment plants. Two forms are commonly available, activated and composted. Activated sludge has higher concentrations of nutrients than composted sludge and is usually sold in a dry, granular form for use as a general purpose, long-lasting fertilizer. There is some question about the long-term effect of using sewage sludge products in the garden, particularly around edible crops. Heavy metals, such as cadmium, are sometimes present in sludge, and may build up in the soil. Sludge use should be guided by results of chemical analyses of the sludge in question. Fertilizer ratios printed on the label indicate amounts of N-P-K, unless otherwise denoted. All fertilizers are labeled with three numbers that indicate the guaranteed analysis, or the fertilizer grade. These three numbers give the percentage by weight of nitrogen (N), phosphate (P2O5) and potash (K2O). Often, to simplify matters, these numbers are said to represent nitrogen, phosphorus and potassium, or N-P-K. Remember that it is not N-P-K, but N-P2O5-K2O. For example, in a 100 pound bag of fertilizer labeled 10-10-10, there are 10 pounds of N, 10 pounds of P2O5, and 10 pounds of K2O. Fertilizer Ratio: The ratio describes the relative proportions of N, P2O5, and K2O in a fertilizer. For example, the ration of 16-4-8 fertilizer is 4:1:2 or 4 parts nitrogen to 1 part phosphorus to 2 parts potassium. To choose a fertilizer formulation, follow the recommendations in the soil test report. Complete Fertilizer: A fertilizer is called “complete” when it contains each of the major plant nutrients: nitrogen, phosphorus and potassium. If plants need only one of these nutrients as indicated by the soil test report, a complete fertilizer is not called for. Balanced Fertilizer: A fertilizer is called “balanced” only because it contains equal amounts of N, P2O5 and K2O. A 10-10-10 fertilizer is a balanced fertilizer. Fertilizer Label: The law requires that the manufacturer guarantees what is claimed on the label. In some cases a fertilizer will contain secondary nutrients or micronutrients not listed on the label because the manufacturer does not want to guarantee the exact amounts. The gardener can rest assured that nutrients listed on the label are contained in the fertilizer. A complete balanced fertilizer contains nitrogen (N), phosphorus (P), and potassium (K) in equal amounts. Granular material is coated with resin or sulfur, which controls the rate of nutrient release from the granules in the soil. Slow-release fertilizers need not be applied as frequently as other fertilizers. Plants may use the nitrogen in slow-release fertilizers more efficiently than in other forms. 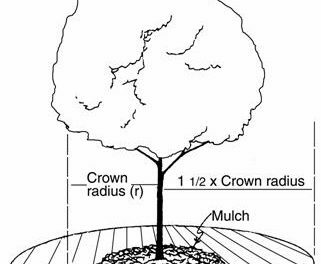 Caution should be used in applying slow-release fertilizers around trees and shrubs because they may keep the plant growing late in the summer. Late-season growth may not harden off completely and excessive winter damage may occur. Special-Purpose Fertilizers: There are fertilizers packaged for certain uses or types of plants such as “Camellia Food,” “Rhododendron and Azalea Food.” These fertilizers belong to the “acid plant foods.” Some of the compounds in these fertilizers have an acidifying reaction so they are beneficial to acid-loving plants growing in soil that is naturally neutral or alkaline. Specialty fertilizers are available for a variety of plant species. Fertilizer/Pesticide Combinations: The major reason for buying a fertilizer combined with a pesticide is convenience. The problem is that the timing for a fertilizer application often does not coincide with the appearance of a disease or an insect problem. Fertilizer-herbicide combinations are available for both pre-emergence crabgrass control and broadleaf weed control on lawn areas. Fertilizer Formulation: Fertilizers come in many shapes and sizes. The type or form the fertilizer comes in is called the formulation. Some of the formulations available to the homeowner include water-soluble powders, slow-release pellets, slow-release spikes, liquids, tablets and granular solids. 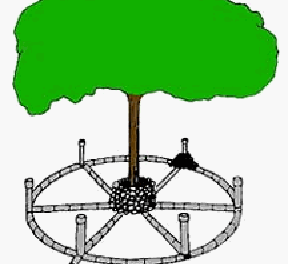 Timing of Applications: Soil type dictates the frequency of fertilizer application. Sandy soils require more frequent applications of nitrogen and other nutrients than clay-type soils. Other factors affecting frequency of application include the plants being grown, the frequency and amount of irrigation, the type of fertilizer applied and its release rate. Root crops require less nitrogen fertilization than leafy crops. Corn is a heavy nitrogen-feeder, while most trees and shrubs perform nicely with one good application every year. It is important to group plants with similar fertilizer needs close together to avoid improper rates of application. In the landscape, plants should be fertilized in late winter or spring. Late fertilization (after July 1) of trees and shrubs can cause new flushes of growth on woody tissue that are normally adjusting themselves for the coming winter. This may delay dormancy of woody plants and cause severe winter dieback in new growth. If you anticipate major insect damage (perhaps a hatch of grasshoppers), decrease fertilization. Tender plant tissues are more subject to damage than tissues that grew more slowly. Application Methods: Methods of applying fertilizer depend on the formulation and the plant’s need. Broadcasting: A recommended rate of fertilizer is spread over the growing area and left to filter into the soil or is incorporated into the soil with a rototiller or spade. Banding: Narrow bands of fertilizer are applied in furrows several inches to the side and below the seeds or plants to be planted. Putting the fertilizer bands too close to seeds will burn seedling roots. Banding is one way to satisfy the phosphorus needs of many plants as the first roots develop. When fertilizers are broadcast and worked into the soil, much of the phosphorus is locked up by the soil and is not immediately available to the plant. By concentrating the phosphorus near the roots, the plant is given what it needs even though much of the phosphorus stays locked up. Starter solutions: One can also use a liquid fertilizer high in phosphorus as a starter solution when setting out transplants. Sidedressing: Dry fertilizer is applied as a sidedressing after plants are up and growing. Scatter fertilizer 4 to 6 inches from the plants. Work it into the soil and water thoroughly. The soil is too cold for plants to extract or use the fertilizer applied to the soil. Foliar-applied nutrients are absorbed and used by the plant quite rapidly. While this method can give relief from nutrient deficiency symptoms, it is temporary relief at best, only affecting the existing leaves and only giving good results if applied in the spring. Foliar application does not address the underlying cause of the deficiency, which is generally an imbalance of the soil pH value or nutrient availability. What’s a Good Fertilizer to Buy? Nitrogen Sources: For quick results, look for a fertilizer that contains the majority of the nitrogen in the nitrate, ammoniacal and/or urea forms. For long-lasting results with a low potential of leaching, shop for a high percentage of water-insoluble nitrogen, which will be more expensive than the readily soluble forms. The best buy for routine garden maintenance is a combination of fast- and slow-release nitrogen. Get the Most for Your Money: If there are two or more fertilizers that fit your needs, but the prices vary, calculate the actual cost per pound of plant nutrients. One way of comparison shopping for fertilizer is to compare the cost per pound of primary nutrients in the various products. Add the nitrogen, phosphorus and potassium percentages; multiply by the net weight of the package to approximate the pounds of nutrients contained. Then divide the cost of the package by the pounds of N+P2O5+K2O in the package to obtain the per-pound cost. For example, a 50 pound bag of 20-3-7 fertilizer would contain 15 pounds of nutrients (that is, 20% N + 3% P2O5 + 7% K2O = 30% of 50 pounds). If the bag of fertilizer costs $6.00, the average cost of the nutrients would be $0.40 per pound ($6.00 per 15 pounds). A higher analysis fertilizer such as 16-4-8 will probably cost more but will cover more area than a lower analysis. Just because a fertilizer is labeled as a lawn fertilizer (or tomato or camellia or whatever) doesn’t mean it can not be used on everything in your yard if it meets the nutritional requirements of the other plants. The exception of course is if a fertilizer also contains a weed killer or insecticide, which might injure certain plants. Don’t buy six different fertilizers if one will fit the bill.